A grant deed is the most commonly used form for a conveyance of real property in California. This type of deed offers more protection to a buyer than a quitclaim deed, but less protection than a warranty deed. The implied warranties in a grant deed are designed to protect the grantee (purchaser). The grant deed includes the implied warranty that the grantor has not conveyed the title or interest in the property to anyone else and that the property is free from any encumbrances done, made, or suffered by the grantor or any person claiming under him, except for any that may be specifically disclosed in the deed (CIV 1113). The main difference between a warranty deed and a grant deed is that in a warranty deed, the grantor will warrant and defend the title against the claims of all persons. A grant deed in California requires the grantor's signature, which must also be acknowledged with a California all-purpose acknowledgement. The officer taking acknowledgements must have a certificate of acknowledgement endorsed on the deed (CIV 1188). Grant deeds submitted for recording must be accompanied by a completed Preliminary Change of Ownership Report. All instruments that are entitled to be entered into the public record may be recorded at the office of the county clerk in the county where the property is located. Recording a grant deed allows it to serve as constructive notice of the contents to subsequent purchasers and mortgagees (CIV 1213). 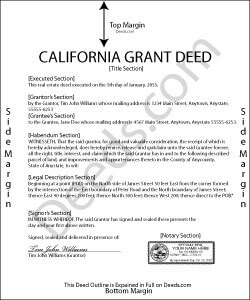 A grant deed in California is void as against any subsequent purchaser or mortgagee of the same real property, or part thereof, in good faith and for a valuable consideration, whose conveyance is first duly recorded, and as against any judgment affecting the title, unless the conveyance has been duly recorded prior to the record of notice of action (CIV 1214). An unrecorded grant deed is valid as between the parties to it and those who have notice of it (CIV 1217). Elizabeth N. said: I love how easy it is to understand and complete.